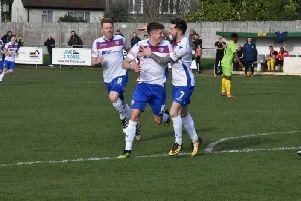 AFC Rushden & Diamonds will look to maintain their play-off push when they head to Rushall Olympic this weekend. Diamonds have dropped to eighth place in the Evo-Stik League South Premier Division Central following the 1-1 draw with Banbury United at Hayden Road last weekend. But Andy Peaks’ team are just three points off the top five although if they are to keep up their challenge, they will have to overcome the only away side who have tasted victory at Hayden Road this season. Rushall claimed an impressive 2-0 win over Diamonds back in November and the setback remains the only defeat suffered by Peaks’ men in 16 home matches in all competitions in the current campaign. “That was one of the few days I have been a bit disappointed,” the Diamonds boss said. “They won the game quite comfortably, they managed it really well and did a good job on us. “It’s another tough game for us but, of course, we would like to go there and put it right. “To be honest, we have 15 tough matches left. You don’t get any easy rides in this division. “I think Rushall are another team who probably had higher expectations for this season than the position they are currently in. “They have proved what a good side they are at times and they certainly have the ability in their squad to be higher in the table. “We are expecting another tough game. But we just need to keep doing what we are doing. The only definite absentees for Diamonds will be young Oxford United loanee Albie Hopkins and John Dean, who are both injured.